Faced with an economic downturn in the second half of the fourth century and various barbarian raids and more serious incursions, Roman Britain exhibited a marked decline in fortunes. Various internal revolts meant that military units were greatly depleted, with two strong forces being taken onto the Continent never, it seems, to return in any great number. Various client states were set up (or officially acknowledged) in the west and north. Renewed war flared up against the Picts of the far north, apparently lasting 'for many years'. Further Scotti (Irish) raids took place on the south coast of Britain in 404/405, just as a major force of imperial troops was being withdrawn. 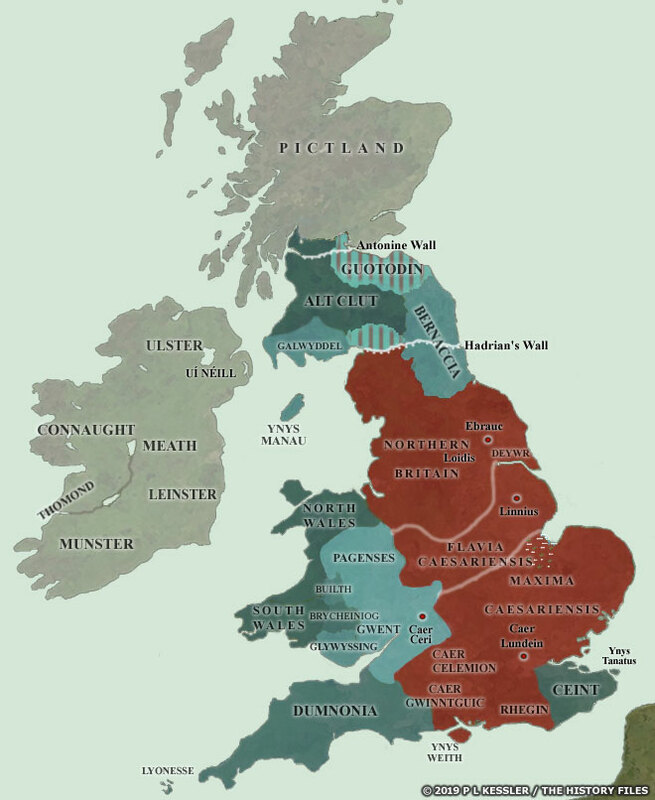 The British provinces were relatively isolated and lacking in support from Rome in their fight against barbarian incursions. In 409 the Britons expelled all Roman officials, breaking ties that were never renewed. All borders are conjectural, but rough territorial boundaries are known. To select a territory for further information (usually in the accompanying feature if an entry is available), click anywhere within its borders.